1980: First contact with martial arts throough Karatedo, style Wado-ryu in the Island of La Reunion. 1982: Starts practising Japanese Budo by Aikido with a priority for Tamura Sensei's teaching. 1984: Iaido. Beginning of the study of Muso Shinden Ryu. 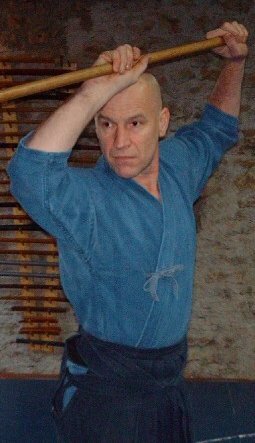 Responsible of various clubs in the Bourgogne region until he founds Dojo Tanren in Saint Gilles in 1995. 1987: Discovery and practice of the «Sweat huts» of American. 1990: 3rd Dan from Tamura Sensei. 1991: Jodo Beginning of the study of Sinto Muso Ryu. 1995: Kinesiology. Beginning of the various existing schools. 1996: Shodo. Beginning of the Japanese calligraphy with Pascal Krieger. 2001: Kamuhi Tai Do. Beginning of the Kenjutsu, Iai jutsu and Ju jutsu of the Kamuhi style with Uemura Sensei. 2001: Jodo 3rd Dan . 2002: 3rd Dan Iaido from Malcom Tiki Shewan. 2007: Jodo Shoden (Pascal Krieger). 2011: Iaido, 4th dan and Chuden. 2013: Ryushin Shochi Ryu Iai Jutsu, 3rd dan and Jun Shidoin from Master Yahagi.